MahaPeriyava Puranam - Daily Nectar - பெரியவாளை வேதம்தான் மயக்கும்! HomeDevoteesDevotees Experiences - ArticlesDaily NectarDaily Nectar : பெரியவாளை வேதம்தான் மயக்கும்! Daily Nectar : பெரியவாளை வேதம்தான் மயக்கும்! (Periyava had a prolonged thought about students getting enrolled into ‘Veda-PAtasAla’, which was dwindling. Even if kids enroll, the students were either not so studious and bright or students those who couldn’t be taken care by parents or because of some family trouble ended up in PAtasAla. Whereas it is told that ‘Vedas’ have to be studied with ‘KusAkRa-Buddhi’ (mind as sharp as the tip of ‘Dharbai’ grass; it’ll look tender but can pierce a cloth effortlessly). After such thoughts for long, Veda-Rakshana-Nidhi was initiated by Periyava. Everyone was planning for a grand celebration of 60th year (Shashtiapthapoorthi) of Periyava in a big scale in Orikkai (1963). At that time, Periyava expressed the desire to get lands for ‘Veda-Rakshanam’. Instead of such celebrations for him, asked everyone, including Sri Kannan Mama and Sri Vaithaa Mama. They did get whatever possible from their sources. Thus born is ‘Veda-Rakshana-Nidhi’! Under this initiative, ‘ParikshA-Adhikari’ will go to each ‘Patasala’. If a ‘Vidhyarthi’ says a ‘PanchAthi’ he is entitled to get a ‘NAlanA’ (4 anAs equals to 25 paise). ‘RendanA’ to him and ‘RendaNa’ to his Fixed deposit. ‘Vathiyaar’ will also get ‘NAlanA’ for that ‘PanchAthi’. By the time the ‘Vidyarthi’ completes, he’ll get about Rs 6,000/-. “ஒவ்வொரு தரம் வரும் போதும் என்ன progress அப்படீன்னு பாப்பா. அதனால, எல்லோரும் பயந்துண்டுதான் வருவா…”, says Sri Kannan Mama. Periyava appointed Sri Annadurai Iyengar as the in charge of this initiative. “ஒரு ஐயங்கார்… கிராப்பு… சீட்டாட்டம்… அப்படியெல்லாம் இருந்து… தலைகீழா மாறி… பெரியவா சொன்னாங்கறதுக்காக… வேதத்துக்குன்னு ராப்பகலா அலைஞ்சு இருக்கார். தன்னோட எட்டு ஏக்கர் நிலத்தையும் அதுக்காகவே கொடுத்துட்டு… அவர் அண்ணா தம்பி எல்லாம் பெரிய உத்தியோகத்துல இருந்தா. ஆனா அவர் எல்லா…..த்தையும் விட்டுட்டு தன் வாழ்க்கையே வேதத்துக்காக அர்பணிச்சுட்டார்!”, says Sri Kannan Mama. 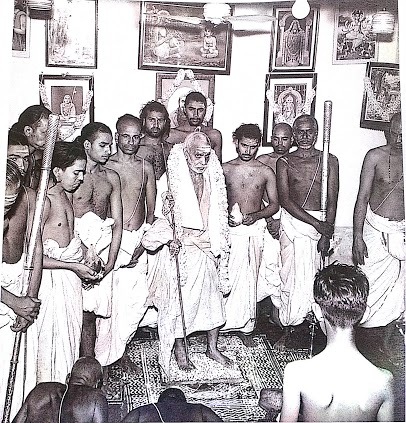 Many people approached Periyava for closing their cases after Sri Iyengar gave up his practice. Periyava advised him to close all of them without getting any payment. “He did so and dedicated his life for Vedas”, says Sri Kannan Mama. Periyava advised, in general, to give the first son of the family or one of the sons for learning the ‘Vedas’. Sri Gowrishankar Mama (Thiruvaannamalai) was in corporate services in Kolkata. Almost twice or thrice a year he will visit Periyava’s camp for darshan. Once at Satara, Periyava enquired about his only son who was about 11 years old and told, “உன் பிள்ளைய வேதத்துக்காக கொடு… அவன் உன் வயசுல உன்ன மாதிரி மூணு மடங்கு சம்பாதிப்பான்!”. Sri Gowrishankar Mama has taken the word. At home, his wife also agreed. So Sri Mama gave their ONLY son to ‘Vedas’. That’s the reason we’ve today got Sri Senthil Ganapatigal. Periyava also blessed another son (nearly ten years after the first) but Sri Gowrishankar Mama decided to give his EVERY son to ‘Vedas’! In this manner, slowly the right ‘Vidhyarthi’ were enrolled into the ‘pAtasAlai’. Every time when a ‘Vidhyarthi’ (students from PAtasAlai) came for the darshan of Periyava, they knew how to get the attention. They may be ignored by the public there. May be ignored by the Sevakas there. May be ignored by the Vidwans there. May be ignored by the VIPs there. instantly Periyava will give Darshan to them. “அது…தான் மயக்கும், பெரியவாளை! வேதம்தான் மயக்கும்!“(Only Vedham can mesmerize Periyava! ), assures Sri Ganesan Ganapatigal (Bangalore). Once Sri Gurumurthy (Indian Express) came with a VIP from Delhi for Periyava Darshan. Periyava was interacting. Suddenly, a ‘PanchAthi’ was recited by few ‘Vidhyarthis’, instantly Periyava left Shri Gurumurthy and the VIP and turned towards the ‘Vidhyarthis’ and began interacting with them. Sri Gurumurthy humbly recollected later that Periyava’s such actions only will make us realize the importance we have to give to the ‘Vedas’ and ‘Veda-Viths’. We can atleast pay our ‘Manasega’ Namaskarams to the feet of ‘Veda-Viths’ or ‘Vidhyarthis’ while seeing them on our way in the road or elsewhere. Because, it is their ‘Vedas’ that alone can ‘mesmerize’ Periyava! (“வேதம்தான் மயக்கும்!”). Definitely, our services to them in whatever manner, will please Periyava! Anantha-koti namaskarams to all those involved with names or without names in ‘Veda-Rakshanam’. Sri Subbaraman mama took the mantle from Sri Annadurai iyengar mama as executive trustee for VRNT. 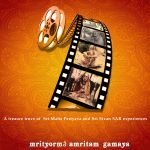 The history behind Sri Mama taking over VRNT is itself history. Hara Hara Shankara, Jaya Jaya Shankara! May Maha Periyava continue to Protect Veda RakshaNa and may we do all that we can to maintain Veda RakshaNa! Aha! Good to note. Anantha-Koti Namaskaramas to Veda-Rakshana-Kaingarya-Mani Sri Subburaman Mama & all those involved. Hara Hara Sankara! Jaya Jaya Sankara!